I've had a wonderful creative ride designing these screenprinted samplers and I'm so glad that you enjoy stitching them up. Me, too. I keep one or another nearby and look for moments to dig in with a needle and thread. These last few weeks, I've been in full-on holiday mode and wanted to design one just for the holidays. A kind of make-and-do Santa's workshop stitch project. So here it is. Stitch the designs on the panel, then cut them apart and back them with felt. Instructions are printed right on the fabric. They kind of look like cookies to me. The fancy ones that are too pretty to eat. This time I'm offering the screenprinted panel with white felt for backing and a skein of embroidery floss too. You still have the option to order just the panel, but I knew that some of you would like having everything in one kit. You can find them in my Etsy shop. the blue rick rack piping and a soft linen backing. It always feels good to finish a project and have it looking right at you every time you walk through the room. Yesterday's worktable stayed quiet while my mom and I made a great escape crossing the bridge to wander around Piermont. It always surprises me how different it is there on the west side of the Hudson in this charming little town of marshes and clapboard cottages. On our side, the train tracks limit our access to the river itself, but over here, everything is right on the water's edge. Click to enlarge and read the story of Last Stop, USA. Although many are closed on Monday, the village shops and restaurants are quite welcoming to visitors and very popular among cyclists who head through on their way down 9W to the Palisades. My mom said she felt like she was in Europe, I thought of summers in Michigan when we were little. If you are in the area just off the Tappan Zee bridge at Nyack, head south along the lower river road, past the candy-colored, Victorian river mansions of Grand View-on-Hudson. Piermont pops up just after. You'll know it right away. Lots of little houses. The kind we love. Today's project here is the bluebirds sampler. I found some of my mother's Liberty of London vintage stash from the days when she made shirtwaist dresses for the two of us. Perfectly sweet with the colors in the embroidery and just right to add width for a pillow. Don't really want to be finished with this design so I'm working another version in all my new shades of blue thread. Will let you know how that goes. Have a wonderful weekend, making the most of these beautiful October days and the inspirations they stir. The word is out that I love old linens, ivory ones with tattered lace trims. My friend Toni was packing to move south and let me know that she was collecting for me. I knew that she was going through family trunks and paring down, but I had no idea that the box would be so big. Or that it would come with attendants. Toni left a note inside that explained that the doll belonged to her husband's mother and that no one really knew what to do with her now. She was still loved, but it was time to find a better home for her. Of course, it was easy to think of me I guess, though dolls aren't really my thing. Ah, the responsibility to our treasures. She was in beautiful condition with a sizable wardrobe, a darling pony friend and a few accessories- including a really wild wig (which I am not sharing because it was kind of a fright-night thing and I think it takes away from her dignity). I knew right away that the doll should go to Joan, my 89 year old neighbor who collects and repairs old dolls. Known as the regional expert on doll collecting and history, she is one of those remarkable women who still uses every home-life skill she learned as a girl. Cooking, gardening, sewing, hobbying, home-keeping and volunteering keep her busy from dawn to dusk. Visiting Joan in the house she grew up in is like stepping into a vintage 1930's how-to book. She's caning a chair or canning her tomatoes or cutting patterns for a new doll dress. Joan has shared her remnants with me too. I did some online research and found out what I could about the doll. When I described her to Joan, she said she'd like to meet her. Yes, meet her. I packed up her things and took her over to Joan for a look-see (or an interview). She asked me what her name was and I was sorry I didn't know. After pointing out that the pony was not really the doll's vintage, Joan was quiet for a few minutes and then matter-of-factly said she'd see what she could do with her. We were both taking things up to the church sale that week and thought maybe the doll could go there after a little primping. Joan said she might like to keep her and would make a donation to the church if she did. A week later I had a lovely message from Joan letting me know that the doll was fully restored. She went on to say that she had named her Alice after the doll she'd had as a child. One that had been greatly loved and sadly lost. One that was nearly identical to this. Isn't it wonderful that Alice found her way to the right home, to the right hands and heart? I let Toni know the whole story. Everyone is happy- perhaps Alice, most of all. Just before the Home Companion Workshops last spring, Matthew Mead asked me if I would make something for his magazine. I was a little surprised by the specific project request- although now, I'm so glad he went in that direction. (Assuming you have ordered a copy for yourself, you will soon see what I made just for him.) While we went back and forth with sketches and ideas, this second project came together as well. A little wool felt cottage ornament for Holiday with Matthew Mead. A pink house, of course. So, so cute! 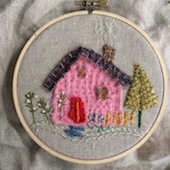 Knowing how much you love little houses too, I thought you would like a kit to make your own. Here is the Hastings Cottage Ornament Kit. It has just about everything you need to make two wool felt cottages, one pink, one blue. Mom lives in the village of Hastings-on-Hudson, a charming, old-fashioned town on the river. It's full of dreamy cottages that I drive by on my way to and from her apartment. Sometimes we wander around the cliffy hills and winding lanes to admire our many favorites. These two designs are named for two of those, the Villard and the Devon. The kit is available to order here on the blog and also in my Etsy shop. Easy, sweet, charming, fun to make and give- just the way we like Christmas! Before I get back to Christmas and what I've been up to, I want to post about our weekend getaway, a colorful roadtrip and visit to the Eastern Shore of Maryland. We spent a few fabulous days with Andy's brother, Tommy and Elena. Such amazing hosts, they love to share their home and local scene. Just the drive down there at day's end was a fine adventure. We headed for the Renaissance Fair on Saturday. A first for us. The day was a spectacular, though breezy, autumn color day. Just right for wandering, people watching and camera play. Robin Hood, Camelot, Ewok Adventure, Harry Potter? This is the place. I enjoyed watching the straw weavers. Halloween season brings out the "dress-up" in everyone. Back to their lovely home-cooked dinner followed by morning coffee on their waterfront deck. An osprey flew overhead. It was hard to pack up and go home. One or two more bridges back, a game on the radio and stitching all the way. Fantastic! Thanks, Tom and Elena!